Brendan Harris' groundout to end Minnesota's American League Divisional Series with New York started a 171-day clock until the christening of the Twins' new ballpark, Target Field. Sony's MLB The Show will have to have the grounds ready much sooner. New stadium construction is not just a problem knotting up state legislatures and city councils. Any sports title developer - any that presents its game as a true-to-life simulation, anyway - must also cope with changes of venue. In the current console generation, baseball has seen this more often than its counterpart team sports in North America, adding five new parks since 2005. The NFL has seen three and the NBA and NHL one each in the same span, and none of those sports' on-field play involve park dimensions in the way that baseball necessarily does. A new stadium takes up roughly 60 megabytes of space on a game disc, but building one takes nearly four months of work, according to Shawn Robles, the lead environment artist, and Jody Kelsey, the senior producer, for Sony's MLB The Show franchise. 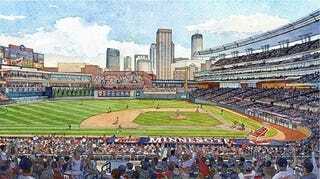 Their studio began preparing for an in-game version of Target Field as soon as they knew it was being built - ground was broken in August 2007 - but the bulk of their construction will come in this game's development cycle, as construction on the stadium nears completion. Only, MLB 10 The Show must arrive in March, more than a month before the first pitch is thrown in real-life Minneapolis. "There's lots of different material that we use when we build our stadiums," Kelsey and Robles said by email. "We always look to obtain blueprints from the MLB team, but we do plenty of research on our own using video from games played at the ballparks, along with going to the ballparks to take detailed photographs. "We started doing research as soon as we heard about Target Field," they said. "Most of the early research was done on the Internet, trying to find artist sketches of the new stadium. By the time we were ready to start with the modeling, we were provided with the blueprints." Kelsey and Robles' team had practice with this over the past two years with the new Yankee Stadium and the Mets' Citi Field, both of which opened this year, and both of which had to be rendered accurately in a game releasing one month before even the first exhibition pitch was thrown. You can see the team's work in these two videos released in January; the parks opened in April. The video they've used of Target Field and other sites doesn't come from game footage of course. In Minneapolis' case, it's come from a construction webcam posted on the team's official site. And for whatever they can't piece together with blueprints, official dimensions, or cam footage, an on-site visit covers the rest of the bases. "As we walk through the stadiums, we take a general sweep of the entire stadium from various views along the warning track," Robles and Kelsey wrote. "This gives us a good understanding of how the stadium should look from various areas of the field. From there, we go level-by-level, taking distance shots and close-up shots of the entire stadium." I was curious just how exacting the in-person visit gets. Does the development crew bust out the survey equipment? Not for the entire venue, they say. "There are two areas we measure; the bullpens and the dugouts," the devs wrote. "Wall heights and distances are published on the club website." Taking specific measurements there make sense; dugouts and pens are in play - at least as far as home runs or foul flies and overthrown balls are concerned. A ball in play that reaches the other unmeasured areas of the park, beyond the known playing borders, will likely be a batted ball demonstrably fair or foul. But that doesn't mean the surrounding confines can be a grandstand shell with a centerfield scoreboard and some major league branding. Even for a new stadium, seamheads are going to notice the little things - pennant and retired number locations, available advertising spaces, and especially late-afternoon shadows - which will return to Minnesota for the first time in 27 years now that the Twins have moved to an outdoor stadium. While some environmental factors can be controlled, for an unopened park others either have to be hashed out in an approval process or just left unknown for the time being. That said, "All of our stadiums do go through an approval process with MLB before the game gets approved," Robles and Kelsey said. "Anything we have the rights to use, we try to incorporate as accurately as possible." The four months of manpower it takes to build a single stadium is, of course, a significant commitment to a game with a 12-month development cycle. But while a year that sees a new field does place a priority on its inclusion, "that doesn't mean we abandon our other stadiums," the developers say. Moreover, once a venue is finished doesn't mean the tinkering stops. Additional park factors, dimensions and features, once they become known, will be incorporated in future versions of the game. "We continue to try to make our current staidums better each year by updating any changes that may have taken place," say Robles and Kelsey. "Along with stadium upgrades, we will be adding new stadiums for use by our triple- and double-A minor league teams." Then there's the question of what to do with the old stadium - in virtual space. Increasingly, these old venues have a useless currency, as professional U.S. teams move into sport-specific stadia and as developers are boxed in by exclusive licensing arrangements. SCEA doesn't develop any football titles - no one does other than EA Sports - so packing up the Metrodome file for use elsewhere isn't helpful. That said, MLB The Show's developers aren't just casting aside the data. "The Metrodome will be saved," they wrote, "and although not quite of a ‘classic' stadium as the old Yankee Stadium, it will be playable as a classic stadium in MLB 10." And it may not be the only green cathedral, long gone, to be explored in next year's game, said the two. "You never know, you may be seeing some nostalgic venues in MLB 10."